IDT Biologika, an international leader in the field of biotechnology, sponsors Peter Kawuma´s National Scholarship (Deutschlandstipendium) since September 2018. Peter Kawuma, 29, a mechanical engineer from Uganda, is currently enrolled in the Full-time MBA at HHL. He started his career working for Schlumberger Oilfield Services in Uganda, Kenya and Tanzania before he realized he wanted to reinvent himself in business management and administration. 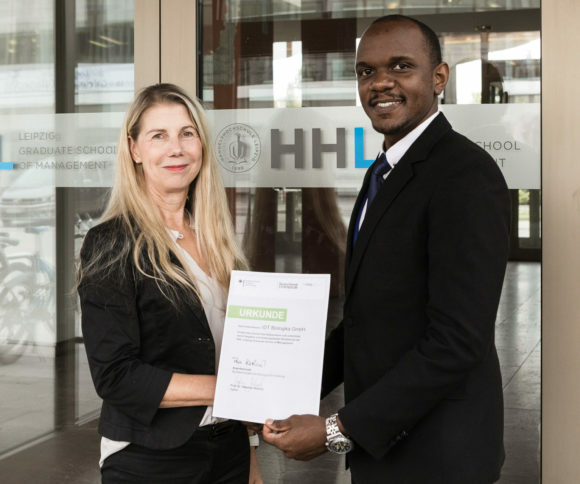 Thanks to family crowdfunding and the HHL Africa Scholarship Program, his dream came true to study at HHL Leipzig Graduate School of Management, his first choice in business schools. While studying, he successfully applied for the highly competitive National Scholarship Program. What do you like most about the National Scholarship Program? Peter Kawuma: “I am really impressed by the company’s willingness to invest in young talent. The level of commitment they show through supporting somebody they hardly know is unique; it fascinates me. It also highlights the fact that there is a lot of generosity in Germany. This has allowed me to study much more comfortably. What are your future plans and goals for your career? “My career goal is to become a reputable manager in logistics and supply-chain management. This includes positions in raw material control, exporting, production planning and forecasting, warehousing and transportation. After completing my MBA , I would like to establish my managerial career in Europe, and work in the region for at least 10 to 15 years. Depending on how my career will unfold, I might stay, relocate to another country or go back to Uganda thereafter. Which projects or internships are you recently involved in, next to your studies? “I am about to finish an internship in logistics with a startup in Halle. The company packages and supplies fresh cut fruit assortments within Munich, Berlin and Leipzig. My task has been to see how customers can receive the product as fresh as possible. What is your story coming to HHL? “I am born in Uganda, and it is really exciting for me to be the first Ugandan studying at HHL Leipzig Graduate School of Management. Sadly, there are very few African students in private universities abroad. Often it is the financial challenge that hinders them from pursuing their dream of a cross-continental education. How did you decide to study at HHL? I was very impressed by the reputation and quality of HHL Leipzig Graduate school of Management. The status of HHL versus the cost for tuition, considering it is a top business management school, makes it an attractive investment. Looking at the terms in the UK, Germany and the US, Germany is the biggest winner for me because of its friendly visa conditions during and after my studies. Following graduation I will have time to find a job and if I can earn an employment contract then I receive a resident permit, which is an exceptional opportunity.